Black Friday, on average, generates eCommerce sales that are more than 3.6x higher than the average day in November — a time of the year when sales are already heightened due to the upcoming holiday season. Companies that effectively execute marketing campaigns around these days can see sales figures several times higher than that. These holidays present an opportunity to not only bring existing customers back into the fold but to catch the eye of new customers and grow your base. But Black Friday marketing has to be effective to work — really effective. Every eCommerce company worth their salt is launching their own marketing campaigns in the month leading up to Black Friday and it takes some serious attention-grabbing material to catch their eye and stand out from the noise. Black Friday is growing but is becoming an increasingly digital-focused holiday, as consumers look to avoid the large crowds that it has become associated with. In 2017, the number of people visiting stores on Black Friday fell more than 4% over the previous year. Meanwhile, in 2017 online sales rose 32% over the previous year, along with the largest Cyber Monday ever recorded. While Black Friday was invented in 1959 and has been seen as a primarily American holiday since that time, we have seen rapid worldwide adoption in recent years. Some countries are growing faster than others. 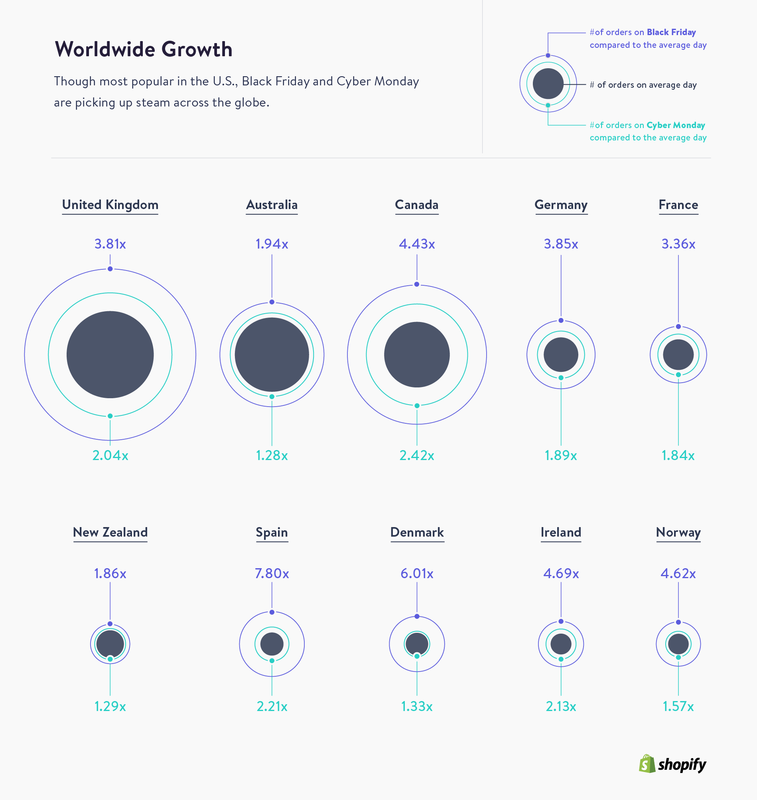 Canada, United Kingdom, Germany, France, Denmark, and Spain are all experiencing exponential Black Friday growth year-after-year. This compounds the amount of traffic that companies can expect and increases the importance of running effective email campaigns during this time. Standing out from the noise of hundreds of Black Friday campaigns isn’t easy. But, there are some simple tips that any company can follow to ensure that they are able to grab the attention of their customers during some of the most important shopping holidays of the year. If you want to run email marketing campaigns that measurably boost your sales during Black Friday and Cyber Monday, you must be prepared. The earlier that you can get started in planning, outlining, and editing your campaigns, the more effective they will be on launch day. By the end of September, 36% of Americans have already started their holiday shopping. By November 15th, more than half are already shopping for the Christmas season. You want to make sure that you are getting on people’s radars early and often so that you are top-of-mind as they hone in on Black Friday. You shouldn’t start planning your Black Friday campaigns just a month in advance - that’s when you really should be building hype for your offers and letting your audience know about your upcoming discounts. 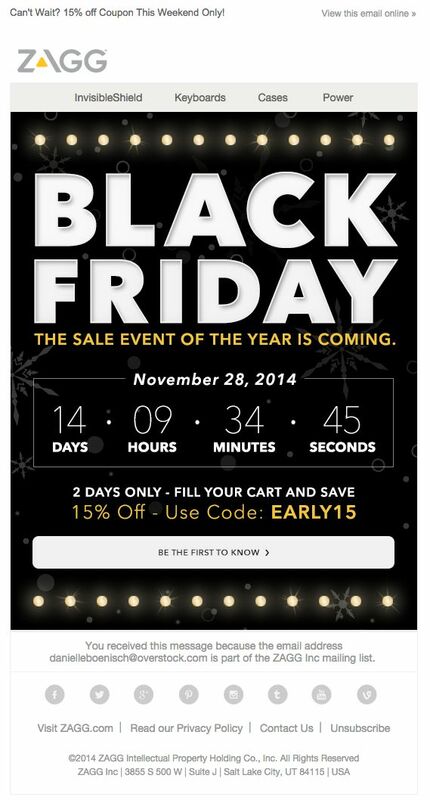 Great Black Friday (and Cyber Monday) campaigns really start several months in advance. They are a part of a larger holiday strategy that encompasses Christmas and New Years as well. You want to make sure that you have every campaign finalized and nailed down weeks before your first email goes live. That way, you can focus your efforts on dealing with unexpected issues as they arise throughout your campaigns. Preparation doesn’t only refer to the work that you do on your campaigns, either. Infrastructure preparation is absolutely critical on Black Friday as well. Your website will be flooded with traffic (particularly if you are offering some pretty steep discounts that attract big crowds of both paying and non-paying browsers) and it is absolutely critical that your servers are able to stand up to that barrage of traffic. Using previous years as a benchmark, your IT teams should work to ensure that your servers are going to be able to deal with the rush of traffic that Black Friday and Cyber Monday represent for your business. Even just a few minutes of downtime can result in measurable losses and missed sales -nevermind what a full half-hour or hour of downtime would mean for your business. In general, make sure that you have all of your bases covered. You don’t want any unexpected issues cropping up in the critical days and hours leading up to Black Friday. An email campaign that doesn’t launch correctly, search ads that don’t have the correct budget set, or technical issues on your website can all hamper what would have otherwise been a wildly successful Black Friday for any eCommerce company. You want to make sure that you can reach as many customers as possible in the weeks that lead up to the Black Friday holiday weekend. As the biggest shopping weekend of the year, the more that you can extend your reach leading up to those days, the more sales you’ll be able to generate when those holidays arrive. In the weeks that lead up to Black Friday, make sure that you are taking steps to grow your subscriber list. 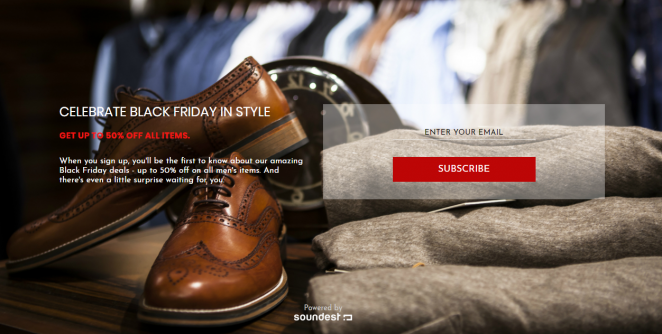 Use urgency and genuinely intriguing offerings around the holiday to convince your visitors to subscribe to your email list and receive exclusive deals. Change your opt-in forms to highlight the type of deals that you’ll be sending their way in the coming weeks. If you can deliver personalized coupon codes directly to their inbox when they sign up - even better. Also, consider other areas of your website where advertisements for your email list might be appropriate. A banner at the top of your homepage could be a great way to grab people’s attention without affecting the conversion rates of other pages. One effective technique you could consider is to create a complete pop-up landing page for your email list. While it does draw attention away from other aspects of your website, it will have a higher conversion rate and help you to fill out your email list with interested subscribers leading into the holiday sales season. In the end, the only way to build hype and anticipation for your Black Friday sales is to get it in front of your customers. 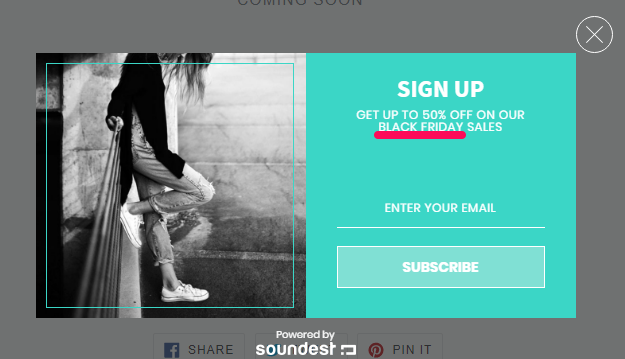 The most reliable way to do that is to convince them to subscribe to your email list so that you can consistently send them details about the sale leading up to Black Friday. Shoppers buy from companies that offer exciting deals on Black Friday. While you may not be able to offer the same bottom line deals that big box stores can offer, there are other ways to build hype and convey exciting offers to your audience. While email marketing is undoubtedly the most effective tool you have in your arsenal for making your customers aware of upcoming holiday deals, you increase the effectiveness of any campaign that you launch when you pair it with an effective social media marketing campaign. You want people to anticipate the upcoming deals that you’ll be offering. Yes, email does provide you with a direct way to inform your audience about your upcoming deals, but there are likely dozens of brands that are trying to inform them through their mailbox. You have to go a step further to stay top-of-mind and build that anticipation over time, which is why being willing to reach out to customers through multiple channels is so important for holiday marketing success. Think of creative ways to build that anticipation. In 2017, Zagg designed a Black Friday countdown clock on their homepage that customers could regularly check out leading up to Black Friday. It isn’t the most original idea, but it is a good example of how you can give your customers a reason to keep coming back and checking your site in the days leading up to Black Friday. Simple gimmicks like this, combined with building awareness to your subscribers through email, are excellent for promoting through social media. Find ways to increase the hype surrounding your Black Friday offerings and keep customers coming back to check for updates. Build images, videos, and other marketing materials that will lend themselves well to social sharing and look for ways to integrate your email and social media campaigns. Other ways to build hype and anticipation around Black Friday can include offer codes, free gifts, and free shipping. One easy way to stand out from the competition is to offer your discounts and deals to select high value customers early (or maybe even all of your customers). By making your Black Friday deals available early, you can get some customers to take the plunge earlier than they normally would have and separate yourself from the landslide of Black Friday deals that your customers will be exposed to in the days leading up to the holiday. Your most loyal customers will appreciate the ability to take advantage of the discounts and deals that you offer in advance of other customers. This is especially effective for customers that have historically spent a lot of money with your company, as you can separate them from the barrage of marketing messaging that they will be exposed to leading up to Black Friday. Additionally, you could consider offering even steeper discounts to VIP customers as another way to put your loyalty to them on display. While Cyber Monday might fall just three days after Black Friday, that doesn’t mean that your company should treat them as the same holiday. There should be differences in the deals that you offer, the messaging of your email marketing, and the types of products that you have on sale. Remember, Cyber Monday was originally conceived as a digital holiday. This means that the types of products that go on sale during Cyber Monday typically lean a little more heavily toward technology and digital products. While the difference is subtle, there is a difference in customer perception of the two holidays and embracing those perceptions in the types of deals that you offer can have a positive effect on your outcomes. By offering different deals and discounts on the two holidays, you give yourself more reasons to reach out to your audience and stay top-of-mind. You also increase the chances that you will be able to bring Black Friday buyers back into the fold on Cyber Monday. There are new products and new discounts that they might be interested in. When you offer the same products and discounts on Black Friday, customers that have proven to be interested in your holiday deals have no reason to come back. With Black Friday and Cyber Monday sales, creating urgency is simple. Because most Black Friday sales are only available on the date of the holiday (some companies have started embracing Black Friday/Cyber Monday sales that last all weekend long, but that is not as common), there is an end date for every sale. That is, a date when your customers will no longer be able to find these products at their holiday pricing. Make it clearly evident that the current offering will expire. Provide your customers with a date (or even a time of day) when the sale will officially end to push them toward the purchasing decision. While it may seem obvious to us, don’t miss an opportunity to create urgency in your holiday sales and remind customers that there is a limited amount of time to take advantage of the offer. Black Friday and Cyber Monday represent huge opportunities for eCommerce businesses. To take full advantage of the opportunity, you must plan and begin executing early. By building hype around your holiday sales in the weeks leading up to them and connecting your email and social media campaigns, you can keep your company top-of-mind during a time of year when customers are exposed to a wealth of marketing messaging. A head start puts you in position for a strong finish and gives you time to shore up other areas of your business before some of the largest shopping days of the year.